The hottest trend in bathrooms has to be timber vanities. Bathrooms can often feel quite clinical – the timeless appeal and warmth of timber really helps to create a friendly, welcoming space. Here’s three companies that make beautiful handcrafted timber vanities. The Super Ks (Kyal and Kara) never cease to inspire us – this time it’s their collaboration with Loughlin Furniture that has us swooning. For Kyal and Kara’s bathroom range they wanted to create something that was unique and timeless, paired with impeccable quality and craftmanship. 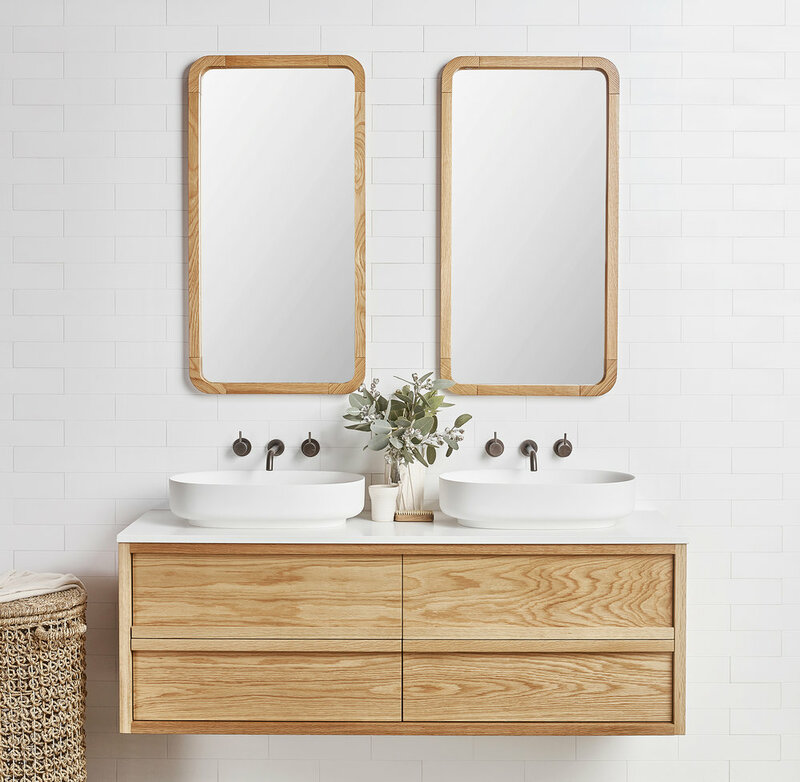 Having worked with Rob Loughlin of Loughlin Furniture for most of their renovation projects, it was a no-brainer that Kyal and Kara teamed up with them to create two vanity designs Airlie and Angourie, along with matching Alura mirrors (all pictured). 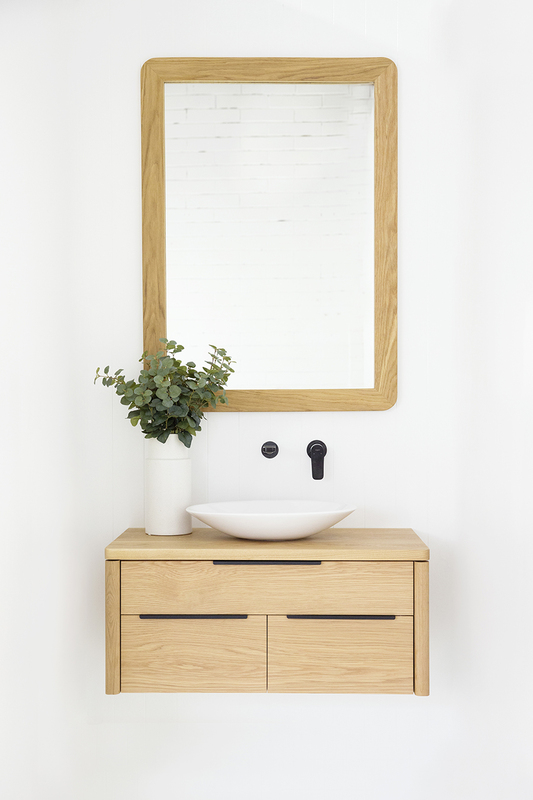 The raw natural beauty of the American Oak will ensure your vanity is the hero of any bathroom. Other details we love – the bespoke timber finger pulls and shaker style end panels. Shop the range by clicking here. 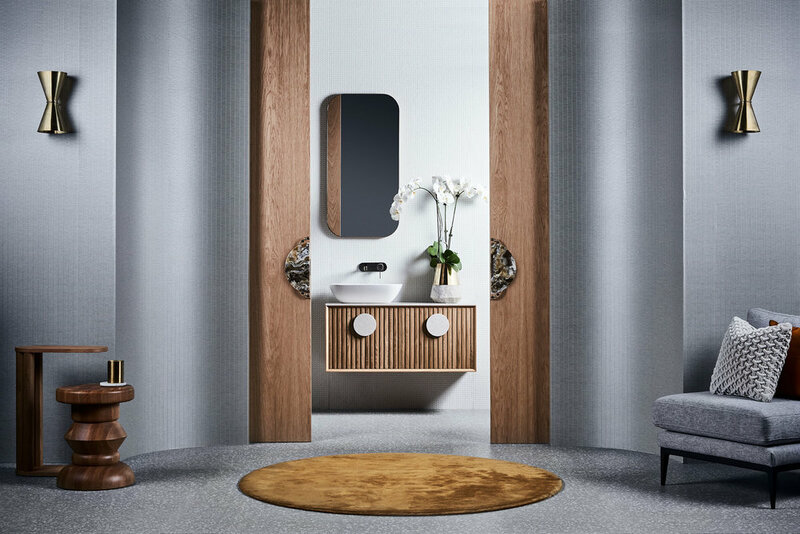 High end furniture label Zuster has teamed up with Reece to create their new Issy Halo range – and it does not disappoint. Striking and bold, this is the vanity for lovers of contemporary design. Inspired by fashion and 3D movement of fabric pleats, the Issy Halo by Zuster furniture range is engineered to stand out – it’s certainly got our attention! We just adore the pleated timber panelling, soft close doors, Corian benchtop and matching round handles. Made from American Oak and available in a range of colours (we’re digging the Charcoal Oak pictured above – very moody), the suite has a thoroughly contemporary, chic feel. Shop the range by clicking here. RAW Sunshine Coast make beautiful handcrafted furniture, and now also vanities! Here’s a look at some of their beautiful vanity designs. Their whole aesthetic is based on understated beauty. 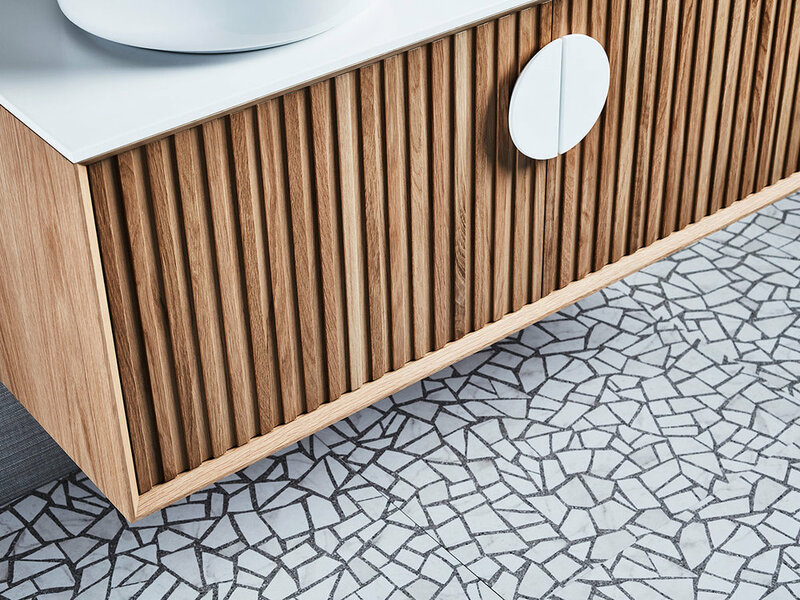 Inspired by the simplicity and functionality of Scandinavian design, the clean lines of their Noosa vanity (pictured above and below) allow the timber to be the hero and deep drawers allow for ample storage. 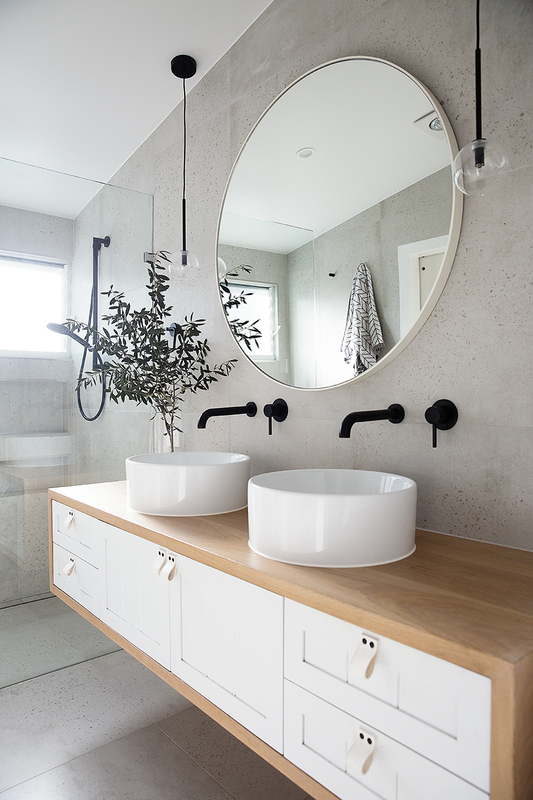 We also adore their Willow timber bathroom vanity (pictured very top) – with its traditional-meets-modern design and the modern curvaceous design of the North Shore bathroom vanity (pictured very bottom). Each of their vanities are available in Blackbutt or American White Oak and made in Maroochydore by RAW Sunshine Coast’s expert team of furniture makers and joiners. They also can custom make something to suit your design needs. Shop the range by clicking here.